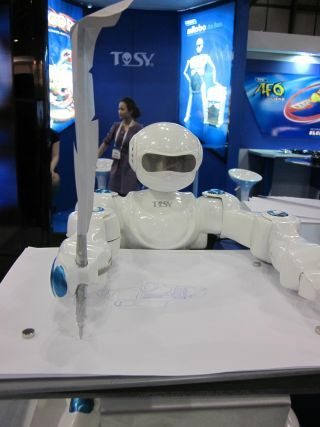 TOSY Robotics' 'SketRobo' can draw unicorns, trees, Spiderman and more. NEW YORK — From drawing robots to stuffed spaceships, the latest in cutting-edge (and just plain cool) toys were on display here at the 109th American International Toy Fair, which concluded today (Feb. 15). SPACE.com was at the Jacob Javits Center, scouring Toy Fair for innovative and fun products to honor with the inaugural SPACE.com Space Age Toy Awards. We selected five finalists, and one winner, in each of five categories: Cosmic Space, Little Scientists, High-Tech Toys, Retro Future and Do-it-Yourself Science. Playmobil's new 'Future Planet' line features astronauts living in a future space colony complete with rovers, habitats and techno-gardens for growing crops. This new line of figures, vehicles and habitats lets kids (and kids at heart) build their own planetary colonies. The storyline has the good astronauts (called "E-Rangers") harvesting energy crystals to power their technology, while the evil Dark Rangers try to steal them. A home base harbors a pod for growing plastic crops, and a fan at the top is powered by a solar panel. These magnetic rods and metal balls can fit together to build all manner of shapes and structures. New this year is a set of glow-in-the-dark pieces that come with wheels and instructions to build a moon rover. This futuristic-looking robot comes pre-loaded with the ability to draw out incredible sketches of unicorns, trees and even Spider-Man. Soon the company plans to release a version that can take photos and draw what it sees. The 'New Space Age Crystal Growing Kit' from Kristal Educational won the 2012 SPACE.com Space Age Award in the 'Do-It-Yourself' category. This kit lets you grow bona-fide clusters of sparkling crystals in bright colors, and assemble the circuits for an LED display base to stand them on. The set also explains why astronauts study crystal growth in the microgravity of space.